Quality construction and energy efficient construction are hot topics for today’s consumer. You need to look no further than the construction oriented reality shows that dominate cable TV. The increased interest in these shows has exposed consumers to a variety of design ideals and products. In addition, you can find volumes of information about products and construction science processes on the internet. The instant access to information has opened the door to a variety of options not previously considered. Unfortunately, many times consumer’s lack of construction knowledge has created significant confusion about the appropriateness and application of these products. We at Mike Blake Custom Homes have tried to take some of the confusion about home products, construction science and energy efficiency by writing blogs and recording short videos about a variety of construction processes, energy efficiency and design finishes. You can find these listed below. Not long ago, very little thought was given to the energy efficient construction. But, families today face problems that weren’t even issues when conventional insulation was developed: rising energy costs, unwanted noise, allergies, asthma and mold. The problem is that too many builders are taking a single instead of hybrid approach to insulation. Hybrid insulation systems combine two or more insulation products, utilizing the products best attributes to provide a cost effective airtight seal around the home. Its not really that different to how we dress for cold weather. We all know a layered approach is more effective and comfortable than a single bulky layered approach. Today’s hybrid insulation system strategy should work in concert to a sustainable high air, thermal and moisture resistance. In response, Mike Blake Custom Homes has created a program called Engineered Energy Efficiency (EEE) that take a hybrid construction science approach that is more cost effective yet more energy efficient than a the traditional approach. The end result is we are the ONLY 100% Energy Star Builder in East Texas. This means a 15% to 40% utility costs saving over traditional home construction! Read more about our innovative approach below. The greatest threat to occupant comfort and health – is air leakage. It has been documented that enough air escapes from a typical house every day to fill two Goodyear blimps(www.Urbanoptions.org). What is meant by air leakage? The high air permeability of conventional fiber insulation, regardless of R-value, allows air to easily pass through walls where the gaps and seams exist. Temperature difference between the inside and outside of home creates convection air currents within the wall cavities. Air infiltration and convection currents in the walls and ceiling are what reduce the thermal performance of traditional insulation. In addition to higher energy costs, this can lead to the transfer of airborne pollutants and pollens into your home and when warm outside air meets cool air-conditioned inside air, or when heated inside air meets cold outside air, condensation, moisture build-up, and a host of other problems, such as the growth of mold or mildew within the building cavity can occur. Uncontrolled air leakage has proven to create the greatest energy loss in almost any home. The U.S. Department of Energy (DOE) reports that up to 40 percent of the energy cost of heating and cooling a home is wasted by uncontrolled air leakage. In addition, uncontrolled air leakage contributes to premature building deterioration, spelling, and ice damming, poor indoor air quality (IAQ) and mold growth. Most homeowners notice the problem through accompanying comfort issues such as chilly drafts, cold floors, or excessively dry or damp conditions. Building science experts agree that an effective air barrier system is the best way to substantially reduce both air leakage and the passage of moisture through the building envelope. WEATHERMATE™ SILL SEAL Foam Gasket is a flexible polyethylene foam gasket strip that can help reduce air infiltration between a concrete foundation and sill plate, around windows and doors – and even between floors. The closed-cell polyethylene foam compresses to seal gaps in irregular surfaces, helping reduce air infiltration for a tighter building envelope and enhanced energy savings. It provides excellent and enduring resistance to water and water vapor. The Huber Zip System wall sheathing is a superior sheathing system. The sheathing’s achieves a multitude of construction objectives. First the sheathing is a built-in water-resistive barrier which keeps bulk water out during and after construction. Once the panels are installed and the seams taped the Zip System creates a code-recognized structural panel, water-resistive barrier and air barrier all in one. In my opinion, this is a much more efficient and effective than OSB and house wrap. In addition, the ZIP System panels are marked with a pre-printed fastening guide for ease of installation. And just as important, the ZIP System wall panels are backed by a 30-year limited warranty. The another component in creating a high performing air-tight building envelope is prevention of air flow through openings in the wall cavity, base plate, and top plate of the frame. I spent many hot summers at my grandmother’s house and I can remember plugging in a radio and actually feeling the hot air coming into the home around the electrical outlets. In those days air would pass between wall cavities through the holes drilled for electrical and plumbing runs. Mike Blake Custom Homes seals each electrical wire and plumbing line that passes through a stud and top plate with expansive foam. MBCH also uses pressurized high expansive foam to fill any voids between exterior doorjambs and the frame as well as around windows. This process is just an additional measure used to ensure there is no transmission of air flow between wall cavities. Working in concert with the ZIP System is BIBS (Blown-In-Blacket-System) featuring OPTIMA from CertainTeed. With BIBS, the OPTIMA is blown in behind special OTIMA fabric. Both products are specially designed for closed cavity application. OPTIMA provides more thermal resistance (R-15) than open cell foam (R-13) and does so more cost effectively. Another outstanding benefit of Optima is it’s custom fit seamless thermal blanket. Even small gaps and voids can be filled with OPTIMA. Another benefit is its sound deadening quality. OPTIMA significantly reduces unwanted sounds and is ideal for offices and media rooms. Lastly, OPTIMA won’t settle or separate. That means the insulation will maintain its thermal efficiency for the life of your home. With almost zero air permeability, the insulating air barrier systems increase building energy efficiency, durability, occupant comfort, health and safety. Radiant barrier decking consists of a thin, highly polished, Kraft paper-backed layer of aluminum foil laminated onto oriented strand board (OSB). Although an excellent conductor of heat energy, aluminum has very low emissivity. While the sun’s heat travels through unprotected OSB or plywood sheathings, the foil at the bottom of the radiant panel intercepts as much as 97% of this radiation. As a result, attic temperatures are up to 40 degrees cooler, according to independent studies. This can lower the load on the HVAC. 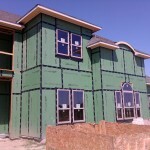 Radiant barriers are very cost effective and can cut energy usage up to 20%. Roof pitches have gotten steeper and attic space larger. Unfortunately as attics got larger the process to remove the build up of heat did not improve. The buildup of heat in the attic can damage personal items stored in the attic, cause shingles to blister and put a strain on HVAC equipment. Heat is removed from the attic through convection. As the attic heats the air rises and exits out of the ridge vents. As it exits cooler fresh air is pulled into the attic through the soffit vents. In the past, there was not enough soffit vents or ridge vents to sufficient remove heat from the attic whack lead to heat building to tremendous temperatures. Today companies like LP have developed a continuous soffit system that allows for more free airflow into the attic. Although most believe that the static air vents at the roof ridge is adequate. I prefer to use power vents to insure the process works properly. LP SmartSide products work and cut just like traditional wood, taking nails and screws with ease. They’re factory pre-primed to take paint, delivering optimal adhesion and consistent application. LP SmartSide products also deliver the beautiful, authentic look of real wood for unbeatable curb appeal. And our proprietary SmartGuard® manufacturing process helps protect against termite damage and fungal decay. Speaking of protection, our 5/50-Year Limited Warranty provides a 5-year,100% labor and replacement feature and a 5/50 Year Prorated Limited Warranty on the product. Watch the LP Smart Siding VS Fiber Cement Video. 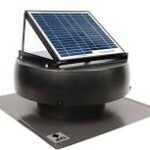 An adequately sized solar power vent is the most cost effective and energy efficient means to properly vent an attic. Its built in thermostat turns on when temperature in the attic reaches a predetermined point. And in Texas with our long summer and warm days the solar power eliminates related utility costs. Today’s solar powered attic vents are tested to withstand the impact hail and foreign object. The brushless motor requires no maintenance unlike traditional motors. When you look outside on a sunny day, you’re seeing the visible part of the light spectrum. But only 38 percent of the solar energy that reaches the surface of the earth is visible. The rest of the light that lands in your yard is invisible. 59 percent is infrared and 3 percent is ultraviolet (UV rays). Even though they’re invisible, infrared and UV rays do affect the interior of your home. Infrared rays can pass in through glass windows, which increases your home’s heat load in the winter and cooling load in the summer. As for UV light, the same rays that burn your skin can enter through glazing to fade and degrade your fabrics and furnishings. Low-remittance (Low-E) coating use microscopically thin, virtually invisible, metal or metallic oxide layers deposited on a window or skylight-glazing surface primarily to reduce the U-factor by suppressing radiant heat flow. The principal mechanism of heat transfer in multilayer glazing is thermal radiation from a warm pane of glass to a cooler pane. Coating a glass surface with a low-emittance material and facing that coating into the gap between the glass layers blocks a significant amount of this radiant heat transfer, thus lowering the total heat flow through the window. Designed for use in hot climates, windows with these coatings admit up to 40 percent less solar heat than ones with clear glass panes. As a result, less heat enters through the glass, so the house is easier to cool. The U.S. Department of Energy (DOE) breaks the country into 3 zones. To meet the standards, windows used in areas like Florida and Southern Texas must have a SHGC rating of .40 or lower and a U-factor of .75 or lower. Mike Blake Custom Homes EEE program meets or exceeds these standards. The HVAC system components are very important aspect of overall energy efficiency. The air handler pulls the old conditioned air in your home across an evaporator coil in the attic. When the air passes across the evaporator coil the moisture in the air condenses and is pulled out of the air. When the moisture is removed, the air becomes cooled and exits the air handler back to the home through the ducting system. Moisture removal is the most important principle in the function of air-conditioning. A properly sized air conditioning system maintains a delicate balance between moisture removal and airflow back into the home. A system that is undersized will run longer than needed in order to extract the correct amount of moister, while an over sized unit will propel cool air to fast into the home not allowing enough moisture to be taken out of the air. This will result in a cool but clammy feeling home and can promote mold and bacteria growth. Cooling unit efficiency is expressed as a Seasonal Energy Efficiency Rating or SEER. The higher the SEER rating the more efficient the system. A higher SEER rating means that the unit is able to extract more BTU’s from the home while using a smaller amount of electricity to complete the task. The less electricity used the greater the energy savings. Many times consumers are lead to believe they must have a high SEER rated equipment. Although SEER is important it has been my experience that if the other permanent components are addressed there is less need for high rated SEER system. Again if we take a layered approach to energy efficient construction no one component needs to be over done especially mechanical components that will wear out eventually. It is estimated up to 10% of heating and cooling efficiency is lost due to air loss through the system. To prevent air loss and insure an energy efficient closed loop system all ducts are sealed (gray material) to the exchange. The corners of the exchange and ducts are also taped with silver insulation tape to further prevent air loss. By sealing all the return air registers, electrical penetrations in the air handler and insulating and sealing the supply registers the system performs like a closed loop system. Typically the ducts are suspended from the roof rafters to provide straighter more direct runs, reduce risk of crushing the ducts and provide ease of inspection. Thermostats control the entire HVAC system. The thermostat recognizes when the temperature in the home has reached the set temperature and activates the system. Digital setback thermostats allow the convenience of setting the system to activate in accordance with four preset temperature models. The Honeywell thermostat that Mike Blake Homes utilizes recognizes each and every day the temperature in your home and changes it’s time of activation each day in order to reach the desired temperature by the preset time. It is estimated that the Honeywell setback thermostat can save up to 33% of your heating and cooling bill, as compared to a standard manual thermostat, assuming of course that all features are properly used. Better construction and the Mike Blake Homes EEE program creates added benefits of better air quality and sound control. Improving indoor air quality is a goal of many new home buyers, especially for those suffering from allergies, asthma or other respiratory problems. Mike Blake Homes EEE program provides an extremely air tight building envelope by eliminating random air leakage, the penetration of dust, allergens and pollutants can be significantly reduced. It allows you to develop a controlled indoor environment so we can design your heating and cooling equipment to maximize air quality. Fresher air should ensure a better night’s sleep and you won’t have to open your windows to achieve it. Humidity can be better controlled so you can eliminate the health concerns about mold and mildew. The Mike Blake Homes EEE program is a smart, effective way to insulate walls to absorb sound waves at varying frequencies, making it possible to design cost effective wall and ceilings with a Sound Transmission Class (STC rating) of 50 or more. With a STC rating of 50, noises from outside are not easily heard. Walls absorb sound, not make it. A fairly quiet room has between 30-50dB of background noise. A home theater boasts of up to 100dB, which means your walls need a STC rating of 50 or more to give the rest of your home a little peace and quiet. A 100dB theater system would produce an overwhelming 70dB of sound in a typical wood stud construction room. But a wall built with using EEE wall system under the same conditions would produce a noise level of just 50dB, that’s 75% quieter. The obvious and immediate impact to a home constructed using the Pinnacle Homes EEE program is a lower utility costs. In fact, all of our homes meet the Energy Star standards for new construction. Energy Star is a government backed program that helps us all save money and protect our environment with energy efficient products and practices. Mike Blake Homes is the only 100% Energy Star Certified custom home builder in East Texas. As you have read, EEE program goes beyond energy efficiency. It’s about providing energy efficient, healthier, quieter and overall more comfort that makes the EEE program the choice for performance and comfort minded buyers. End your search for custom homes in Dallas, Pittsburg, Winnsboro, Tyler, Sulphur Springs and in Rockwall with Mike Blake Homes. Contact us today for FREE home estimation.